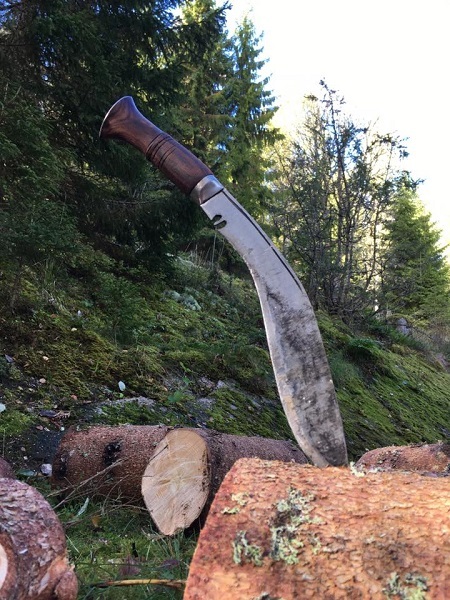 The Neglected Treasure of the History; the KHAKI or DESERT kukri of the British Gorkhas..
A legendary kukri from the glorious history of the Gurkhas but neglected and overlooked (forgotten) perhaps due to ignorance and less research. 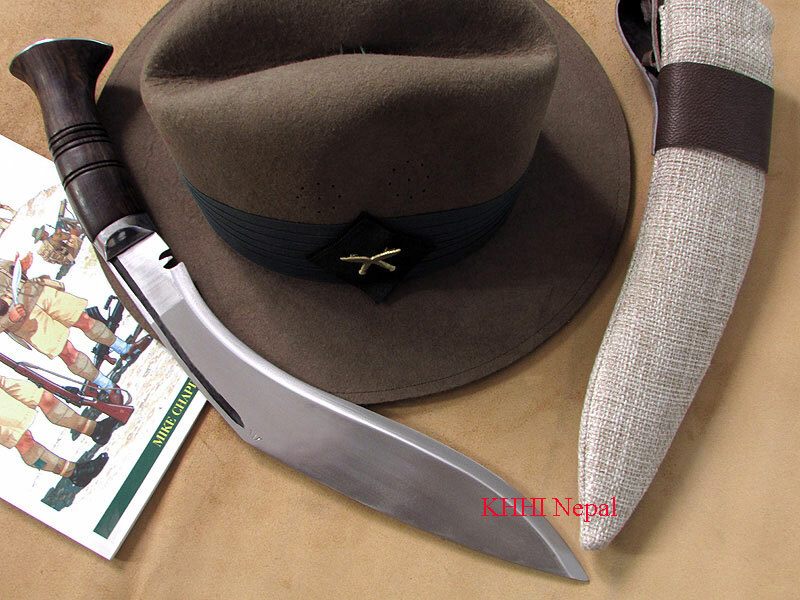 Widely used in the desert land of the western frontiers, Khaki or the Desert issue kukri faced many military actions and battle honors that set this kukri and the Gurkhas stand out from the herd.. It's a true utility knife and personal weapon at the same time. 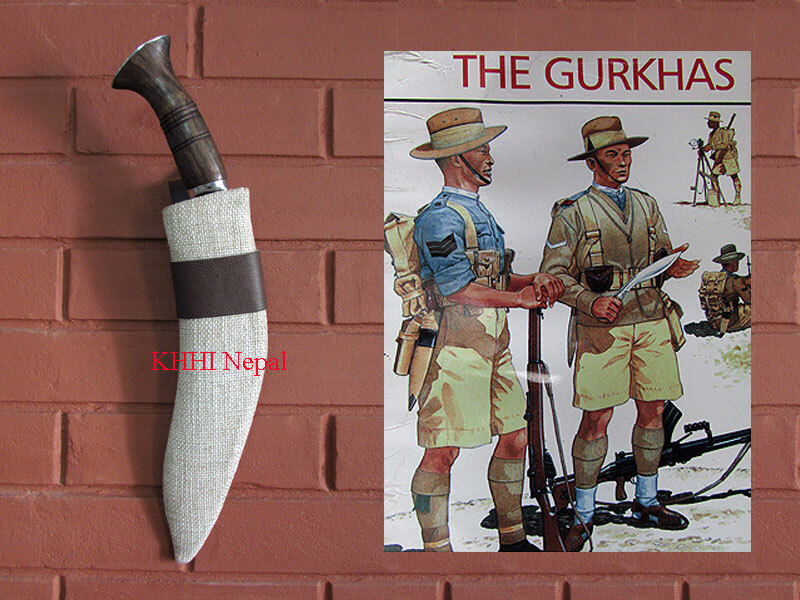 The excessive study and research by KHHI and the historic documentations support to the fact that in the early and mid years of 20th century Gurkha Soldiers were also issued with kukris camouflaged by “khaki” (olive yellow canvas) fabric for various operations/campaigns at different places. 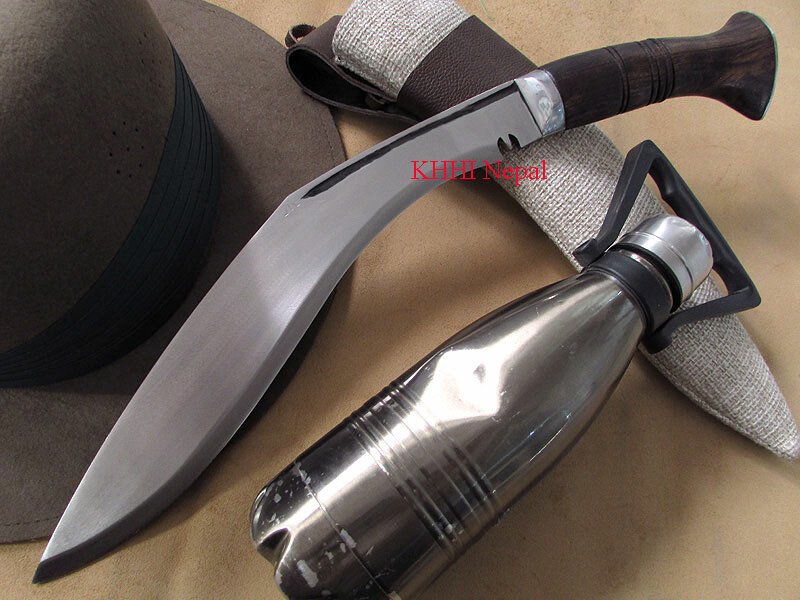 Now, reproduced here as the “Khaki Issue” to represent it; the Khaki version of the historic WW kukri by KHHI Nepal. The distinctive part of this khukuri is its 'Khaki' fabric used in the scabbard/ sheath. 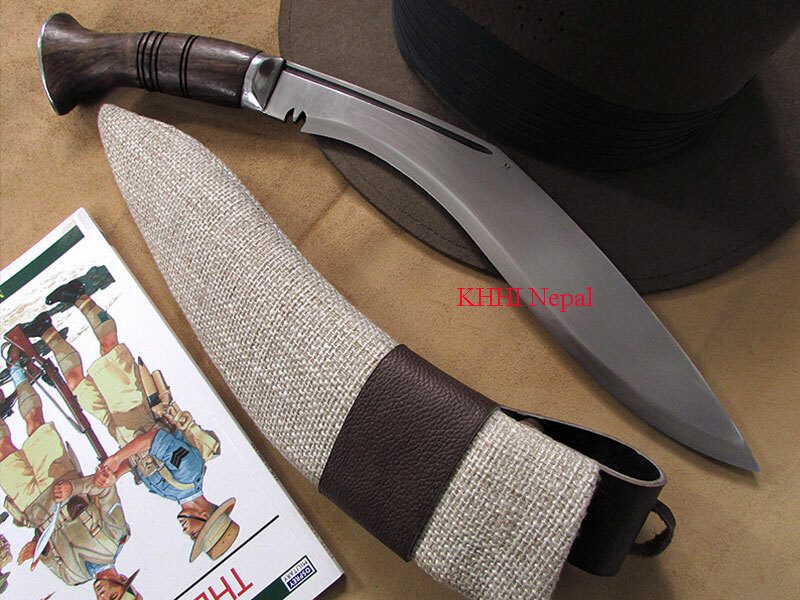 Gorkha (Gurkha) soldiers covered the leather sheath (black most of the time) by a rough fabric like sack in khaki color (pale yellow) to blend their kukri knife with the surrounding of the terrains and to also camouflage it with the wears and gears he owns. The sole purpose was to match the complete set and avoid any unwanted attention. The fabric also well protected the sheath and in return soldier had a lasting kukri in hand. The blade’s shape is very different from the other issue models. Its little slender, has pointed profile, steep peak and very less pronounced chest as seen in the photo. The shape is fairly curved with the upper shoulder coming down from the peak quite steeply. It has a curved wooden handle with steel fixtures having stick tang hidden inside. The bottom inward cured handle makes the holding very ease and effective. Two accompanying knives (Karda and Chakmak) are not included. It is believed that in 1930’s the practice of covering the kukri scabbard with khaki cloth appears to stem from about this time when Gurkhas were called upon to secure the North-West frontier, an area rarely at peace. However our research also points to the fact that it started much earlier in 1915 when Gurkhas were deployed in the Middle East during 1st world war. 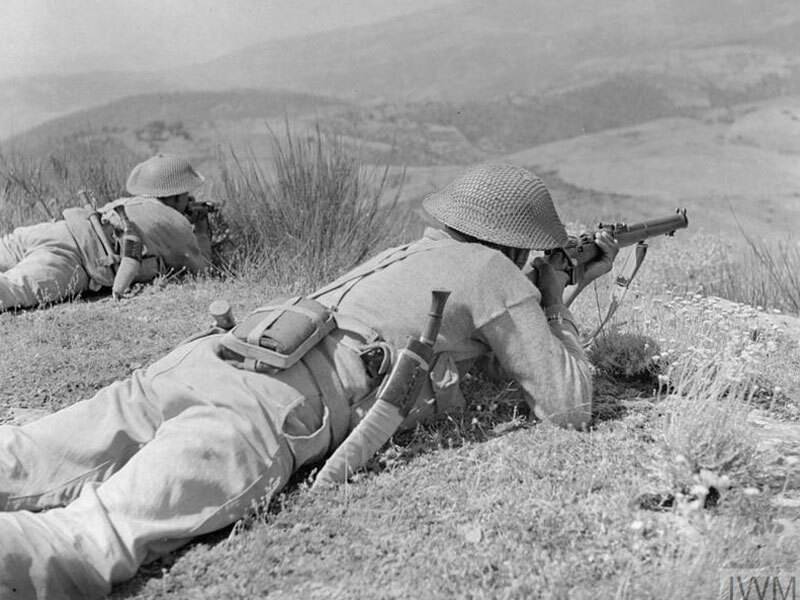 Similarly the practice/issue also followed in the outbreak of 2nd world war in series of operations when Gurkhas landed for the North African campaign in 1940-43 and in Sicily and Italy in 1944-45. Likewise the Khaki and sometimes Green army fabric version, of the World War kukri continued in 1945 when Gurkhas played a crucial role in containing the Japanese invasions and also in regaining the lost territories in the Far East during the 2nd World War. This practice initiated when Gurkhas adopted themselves to best suit the environment, surroundings and to perfectly cope with the places to maximize their output. The total uniform/outfit was replaced by khaki in the above mentioned fronts and so was the kukri, to camouflage from the enemies’ eyes. Handle size: 4.50 inches approx. Never far away when I’m processing wood. The khukuri is the ultimate tool for stripping a tree of it’s smaller branches. 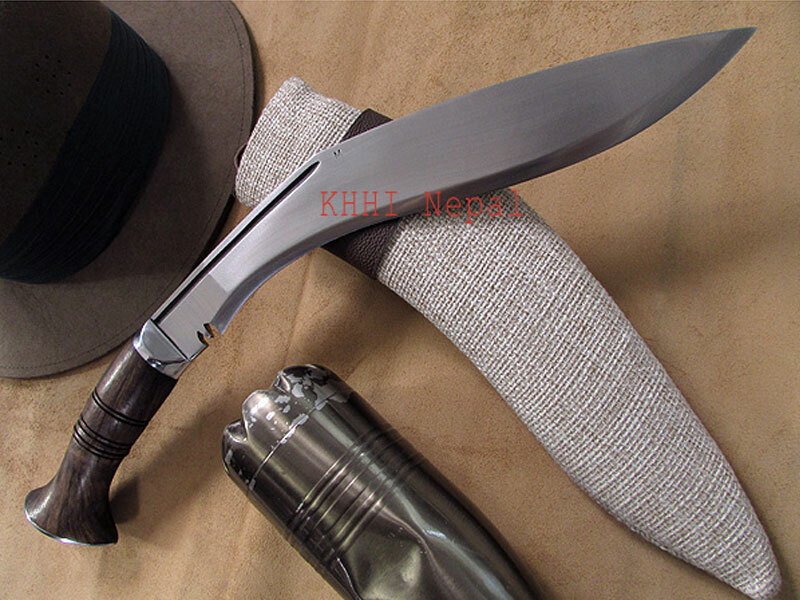 Khhi khaki issue khukuri. I have just received my khaki khukuri. My first impression was I couldn't Beleive how big it was. This is a very impressive blade and the maker did a great job (M). I am extremely happy with it and am already debating on ordering another one. I enjoy the history and fame of the Gurkhas. Currently reading a book on them now. This isn't my first khukuri and from this last purchase I can't see it being my last.